The Bike Friday New World Tourist: How Fast Is It? The truth is, no, Bike Fridays and similar folding bike models are capable of going just as fast as your full-size bicycle (up to a limit). It’s all in the gearing. A single turn of the pedals on a Bike Friday will cover the same ground as that of a regular wheeled bike — the small wheel just turns a little more. The gears on a Bike Friday are configured to match the ratios of a regular bike. Small wheels climb better due to a smaller diameter that needs to be rotated. Small wheels accelerate faster for the same reason. Small wheels are more responsive — they turn and steer more easily — the feel is rather like having ‘power steering’ on your car. Small wheels, having a lower surface area, have lower wind resistance in headwinds. When riding in a group, small wheels enable you to get closer together and draft better. The design of a Bike Friday allows a smaller and and lighter overall package than a regular bike, and smallness and lightness are factors in going fast. 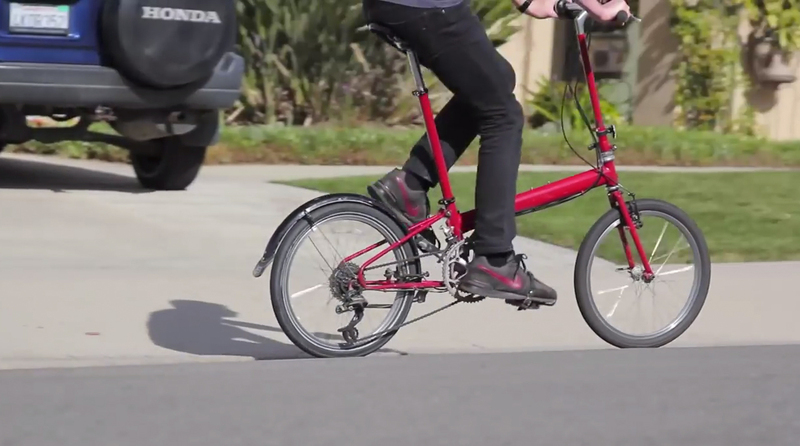 Tests have shown that up to 16 mph, the small wheel is more efficient than a big wheel. Between 16 and 33 mph there is little difference. Over 33 mph the gyroscopic effect of the big wheel makes it more effective. Most folks do not go over 33 mph. I can verify that what Bike Friday is saying about the speed of their bicycles is true. I have traveled with the Bike Friday New World Tourist for more than four years and covered thousands of miles on the bicycle, and I go just as fast on the New World Tourist as I do on any of my other touring bicycles. If there is any difference in the speed of the bicycle compared to my full-size touring bicycles, it isn’t something I can noticeably feel. The only area where the Bike Friday and similar 20 inch wheeled bicycles fail to perform as well as full-sized bicycles is in traversing over large objects in the road, such as cracks, rocks and curbs. It is here that the larger wheels excel, due to the fact that their large circumference allows them to easily roll over certain obstacles in the road. Small wheels, however, have a harder time rolling over these same sized objects due to the fact that the circumference on folding bicycle wheels are so much smaller, and the proportions between the small wheels and the object that is being crossed over, is that much greater. Watch the video above and you will see a few samples of how the Bike Friday New World Tourist performs at speed, in sharp turns, and going up and down a curb. This entry was posted in Bicycle Touring Pro Articles, Bicycles, Featured How-To Articles, Main Articles, Products, Videos and tagged bike friday, bike friday new world tourist, can folding bicycles go fast, fastest folding bicycle, folding bikes and speed, how fast are folding bicycles, how quick are folding bicycles, miles per hour on a folding bicycles, slowest folding bicycle, top speed on a folding bicycle. My goal as the "Bicycle Touring Pro" is to give you the confidence and inspiration you need to travel by bicycle anywhere in the world. 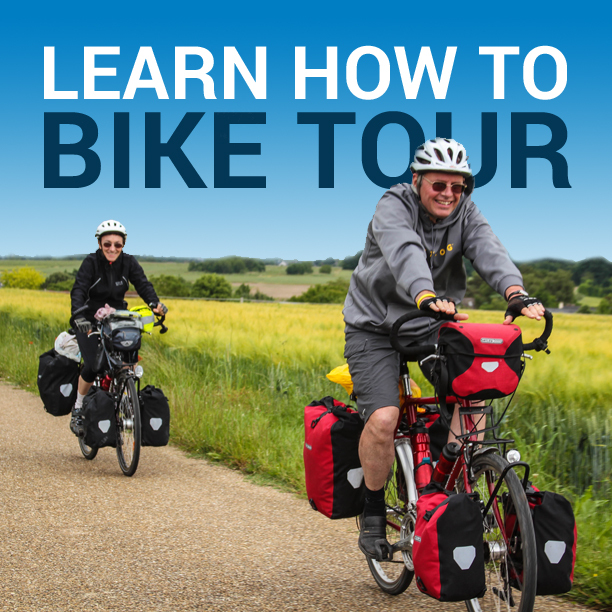 I'm here to help you plan, prepare for, and execute your first bike tour and remove all the guesswork, wasted time and frustration that plagues so many first-time bicycle travelers. Do you use the same length cranks on your Bike Friday as you do on your other bicycles? How do you find the BB height? I am assuming that these things (my questions) are non-issues as the BFs appear to be very well designed and regarded, but just curious to hear your opinion. Are you trying to suggest that people should buy BFs because they are fast, because some of the arguments that you put forward and minimal or even irrelevant for the daily use of a folding bike. I am guessing that you actually agree that the BF statements copied from their website are substantial and important enough to be repeated here..?.. really..? Here’s some of the quotes with alternative views that some might think are more important…. — does the smaller and lighter overall package include the allowance for the single main tube instead of a stiffer diamond frame?.. or the folding hinges..?.. if I was going to pick a bike to go fast on, I wouldn’t pick a BF because it was “small and light”.. I’d pick a carbon bike, because compared to the BF, they ARE small and light..! No. ha! This isn’t an advert for Bike Friday. I just wanted to share “How I feel” when riding my Bike Friday, because I get asked about how they handle quite a bit… and this video is my response. That is all. I know others may not feel the same way, but when trying to quickly and easily explain things… this video pretty much sums it up in my mind. Great summation of small-wheel riding characteristics Darren. And excellent vid. Nice bunny hop over that curb. You wordlessly demonstrate that the (minor) drawbacks of small wheels can be overcome with properly adapted and executed technique.You have very good form. I’ll point out for those who don’t immediately realize that it is extremely important to keep the pedals level in that maneuver on small wheel as there is much less clearance. I also believe it’s very good to have a solid bash guard to protect the very exposed chainwheel, both folded and unfolded. I have two folders, a 20″ Dahon and an 18″ Downtube. The Dahon is my main bike. I agree that there’s no noticeable speed difference with small wheels. And agree there are two or three minor drawbacks. I take extra care at railroad tracks etc as they’re more vulnerable to trapping. I find ‘road buzz’ harsher with smallys than cumbersomes. I ride fat tires to (Big Apples) help overcome rough road surface. Also I have a sprung saddle and cushy Ergon grips. The quick steering of smallys has advantages and disadvantages. I find it necessary to keep both hands on the bar most of the time when not ‘cruising’. Can make signaling, for example, or fussing with things on the bike interesting. Also the typically shorter ‘cockpit’ means upper body setup (handlebar, stem, saddle adjustment etc) can require careful consideration to get both touring comfort and foldability. Luggage has to be selected more carefully; small wheels don’t take large bags. The advantages FAR outweigh the disadvantages. Speed differences are not even a consideration. I think as more people experience smallys they will choose them and we’ll see a LOT more of them. Along with internal hubs and belt drives. Hey how do you load your smally for touring? Do you have a front rack, how much do you load it? Which do you take more often, folder or nonfolder? Brimstone, again, see my full review of the Bike Friday New World Tourist. There you will see how I pack the bike and how much you can carry on it. In 2009 I traveled for 9 months across Europe with that bike, and have used it on several smaller bike tours. This year I will be traveling with a different bicycle – the Co-Motion Pangea, which is a full-size bicycle, but which can and will be upgraded with S&S couplers, which will allow me to take the bike apart and pack it down to a much smaller size. I’ll let you know how it works out, just as soon as I’ve had some more experience with the bike on the road. I have a folding bicycle. This article is interesting. It was interesting about efficiency at speed, especially. It is good to accelerate from stop on an incline. I would add, I have no problem on descents. The bicycle is stable. I have considered different tires. I have thought Schwalbe Big Apple tires would be more comfortable on those bumps and cracks and things like that. If those tires have low rolling resistance, I think I will make the changeover. Yes Connie the Big Apples are great. Make sure they’ll fit under your fenders. I can fit the 2 inchers but not the wider ones . Thank you, I will go with the 2 inchers. All sizes of wheels have been duly tried over the evolution of cycling and 20″ wheels never caught on – a common rule of thumb is 700 for taller than 5’4″ people and 650 for shorter than 5’4″ people. Notably, 700 wheels became more popular as people got taller and taller. So it is a far stretch to say 20″ wheels can compare well to larger wheels in handling. But I had a 20″ folding bike and enjoyed it tremendously for ease of travel on both business and pleasure. THAT is the great reason to own one. Please don’t risk going downhill fast on it though. Probably 20 mph max? Take it slow and enjoy yourself.